We Demand an End to Assad’s Regime. We Demand Effective Protection for Syrian Revolutionary People. We Demand Responsibility and Accountability. 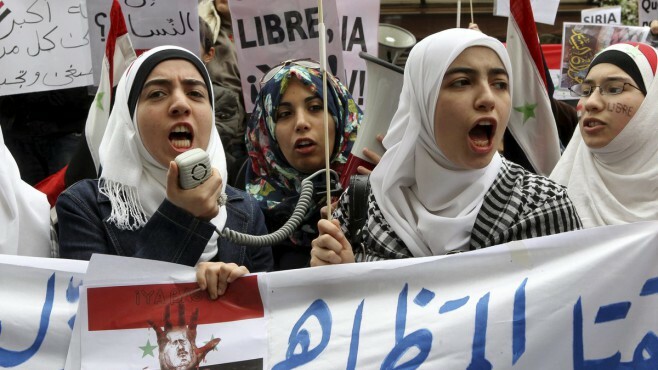 Thousands of Syrian women and children blocked a main coastal highway Wednesday, 13 April 2011, demanding authorities release detainees picked up during a crackdown on opponents of dictator Bashar Assad's authoritarian regime. The inhumanity of dictator Bashar al Assad is appalling and apocalyptic. People in Syria have been under a prolonged and bloody assault by Assad’s forces, the violent repression is increasing on a daily basis, while governments around the world have kept their silence. The ongoing genocidal slaughter in Syria by Assad’s troops, and the concomitant refusal to act by responsible governments worldwide, is not unique in the history of Syria. It is a bloodcurdling echo of Hafez Al-assad’s 1982 massacre of Hama, and the criminal complicit silence of governments worldwide at that time. Then, an estimated 50,000 civilians were slaughtered by Assad’s forces in full view of the international community, which kept its silence. Now, Bashar Al-assad’s forces have again declared war on Syrian people; thousands have been killed in full view of the world, and once again, governments that have a responsibility in the face of crimes against humanity under the Geneva Convention remain criminally silent. The ongoing crimes against people in Syria must be opposed in their own right. The forces of Bashar al Assad have perpetrated massive slaughter against Syrian people for the past 6 months, including the Ramadan Massacre in which hundreds were killed over a single weekend. The attacks on the people of Syria, implemented using weaponry from tanks to snipers, have culminated in the loss of an estimated 5,000 lives; real numbers are likely higher. On this basis alone, these crimes amount to genocide and crime against humanity. The necessity of ending the slaughter of the people in Syria is obvious, and the UN Security Council has a legal duty and mandate to stop these crimes by all means legally available. It is in the context of these crimes against the people of Syria – and, by extension, all humanity – that we call humane society to urgently recognize the importance and necessity of unconditionally supporting the people struggling in Syria; and our role and responsibility in demanding an end to the slaughter of people in Syria. There are practical ways to enforce an immediate end to these atrocities, none of which have been seriously negotiated. We demand unconditional support of the Syrian people and their revolution because any other approach is, from a humane perspective, unethical. We demand unconditional support, because only this guarantees a progressive outcome for people’s revolution, a free and peaceful Syria which directly changes the balance of political powers in the region in favour of people in Lebanon and Israel and Palestine and Jordan and Iraq and Iran and against the Islamic terrorism, political Islam and Zionism and militaristic politics dominating this region. A free and humane Syria means that Syria would no longer function in the service of the Islamic Republic of Iran, which funds its proxies in Lebanon as well as in the territories occupied by Israel. Assad’s regime is essential to enable the Islamic Republic’s aggressive political and strategic presence as the standard-bearer of political Islam outside the gates of Israel, the most important ally of the West and the most vital element of US militarism in the region. Without funding from the Islamic Republic, the proxies of the regime dry up, as do the real as well as presumed threats to Israel of terrorist Islamic organizations in Lebanon and the occupied territories. Israel then can no longer rely on the “wolves outside the door” argument to justify its continued occupation of Palestinian territories and its repression of and inhumanity towards Palestinian people. With the attention of people of Israel shifting from the “enemy” outside the border to the real enemy within, and the consequent cessation of Zionism and Israeli militarism, the US will be forced to fundamentally readjust its politics and redefine its relationship to the entire region. Without recognizing the critical importance of the Syrian revolution to progress towards a humane society in Syria, the Middle East and, indeed, the world, the reaction of responsible governments to the situation in Syria will remain not only unacceptable, but criminal: Russia is still delivering weapons to Assad, the Islamic Republic of Iran is still pouring cash and snipers across the border to fund and implement the slaughter, and actions taken by the Western world remain disproportionate to the degree of inhumanity and violence against the people of Syria. Between Assad’s regime, as one of the remaining tyrannies of the past and the alternative that Western governments have attempted to impose on people revolting in Syria and throughout the region, and the counterrevolutionary forces of “a democratic, moderate Islam” of a Turkish or Afghan calibre as another alternative also backed by the West, there is a third front that has been struggling to organize itself and raise the banner of revolutionary demands – bread, human dignity, and freedom. This front is rising across the world, most visibly and vocally since the 2009 uprising in Iran. This third front, the humane front, stands with peoples’ demands for freedom, equality and a humane society. It opposes the repressive and reactionary forces that want to silence in a hail of bullets the voices of people raising their justified and humane demands. We, the humane front, need to organize and mobilize our forces to put forward our own agenda and demands. We cannot allow the slaughter in Syria to continue unopposed, and at the same time we cannot allow Western governments, with their political, economic and strategic interests that are contradictory to the interests of the revolutionary masses, to impose their agenda on people who are fighting and dying for their right to build a free, prosperous and humane society. The pressure that people impose on Western governments determines the degree of their reaction to the atrocities against the people of Syria. – It is not acceptable that Western governments have not yet frozen all the assets of the Syrian government. Bashar al-Assad today is still able to finance its genocide. A political sanction targeting Assad’s vital resources should be implemented immediately. We will call for a total economic boycott against all political, military and technical supporters and allies of the tyrant of Damascus such as China and Russia. – We cannot allow the representatives of the butcher Bashar al Assad to occupy seats that do not belong to them at the UN, in embassies, and in other diplomatic centres. These diplomatic centres have long proven to be tools that legitimize genocide. We do not negotiate with murderers of our brothers and sisters. We indict, prosecute and punish them. Syrian embassies and diplomatic centres belong to the people revolting in Syria, and will house true representative of the people soon. The world must send a clear message to the murderer of the Syrian people that his regime has passed the line of no return and there is no future for his tyrannical regime in Syria. His regime has lost all legitimacy and he has to go. We cannot leave issues that impact the live of millions of people to be dealt with behind closed doors by Western governments that are moving to extract their own self-serving interests from revolutions against the most murderous dictators, revolutions in which the blood of people is spilling daily in the pursuit of freedom, equality and a humane society. We have the following demands. 1- Close Syrian embassies. Our demand that Assad must go now is not negotiable. This is not a matter of diplomatic nature. 2- Block all the financial resources of Assad’s regime immediately. 3- Implement a UN resolution acknowledging that the Syrian people’s future government has no obligation to pay for debts incurred by Assad’s regime for purchase of armament, military technology, military equipment, etc. All existing contracts may be terminated unilaterally by the future government with no penalty to be paid by the future democratic Syrian government. 4- Immediately issue an arrest order for Assad and all of those responsible for making this genocide possible. 5- Forbid all direct and indirect flights by the Islamic Republic of Iran’s aviation to Syria. The Islamic regime is supporting the Syrian genocide through infusions of cash as well as technology. There are reports of direct involvement by the Islamic Republic Guard Corps in the ongoing genocide of the Syrian people. 6- Governments with seats in the UN Security Council have had a mandate to act on behalf of humanity and stop the genocide in Syria – both in the 1980s and now. In violation of their mandate, they chose not to act then, as they are choosing not to act now. Responsible governments should therefore be held responsible for for their inaction then and now. Our first demand in this regard is compensation for all losses of human life, from the time of the 1982 massacre to the ongoing massacre, and all intervening years. No one can claim that there is legitimacy for a government that has killed as Assad’s has. As it is not possible to defend the legitimacy of such a regime, all demands, from the closure of embassies to the arrest of Assad and his facilitators, become not only possible but imperative.